Across The Pond Wrestling: Wrestle Ropes Ready for the Weekend: August 2016 Week Three - GPW, IPW:UK & ATTACK! Wrestle Ropes Ready for the Weekend: August 2016 Week Three - GPW, IPW:UK & ATTACK! After a few weeks of being away due to one thing or another we're back and with quite a tasty looking weekend coming up, it's just in the nick of time! This week we are off back to Hindley in Wigan for Grand Pro Wrestling on Friday night. Saturday shall see IPW:UK back in Snodland, Kent for their 'Future #20' event and Sunday will round off the weekend with a trip to Cardiff for Attack! Pro Wrestling's return to Walkabout. Let's get Ready For The Weekend! Friday night kicks off the the wrestling weekend with Grand Pro Wrestling holding their Midsummer Madness event at The Rose Club in Hindley, Wigan. The show will see the return of the Fast Track 4-way match where the winner will challenge for the GPW Heavyweight & British Championship the same night. This time will see Jimmy Jackson, Ashton Smith, RJM and Joey Hayes compete in the match. This is a huge opportunity to jump right to the top of the mountain in GPW and become a champion. If the Fast Track winner decides to challenge for the GPW Heavyweight Championship, they could be facing one of two men this Friday. Current champion, T-Bone is already scheduled to defend the championship against Dylan Roberts in what shall no doubt be a nasty and brutal match. Both men will also have to keep in mind that they could well be defending the championship again the same night if they win. We're in for organised chaos at Midsummer Madness as two sets of tag teams teams will have to co-exist in an 8-man tag team match when The Island Brothers and The Midnight Bin Collection face the duo of Martin Kirby and The Sheikh and The Hate League. Soner Dursun and Danxig of Hate League are the current GPW Tag Team Champions which will be on the mind of everyone in the bout. Island Brothers and Midnight Bin Collection would love a win over the current champions as a way to have future championship match. One question to be answered is can Hate League trust Kirby and Sheikh to have their back or will they have their own agenda at The Rose Club. T-Bone (c) or Bubblegum vs ??? Moving on to Saturday and the Snodland Community Centre will play host to International Pro Wrestling: United Kingdom Future #20. Scott Star who has been on a winning run in recent months will be taking on the biggest and toughest opponent of his career this Saturday when he face world-traveled star, PJ Black. Star is used to facing high flying opponents and has matched them every time. Now is a step up in skill with 10-year+ veteran PJ Black as his adversary. If Star can continue his winning ways this will be the biggest win yet of his young career and could lead to amazing things. Championships will be on the line this Saturday at Future #20 as Danny Duggan and Cieran Donnelly defend the IPW:UK Tag Team Championship. DND have had a lengthy reign as champions and are as close as brothers in the ring. Their challengers, they are possibly even closer as they are actual brothers. The Dunne Brothers. Pete and Damian Dunne are highly skilled individual wrestlers and together are exceptional. DND have welcomed all challengers so far and will indeed face a challenge in Dunne Brothers. 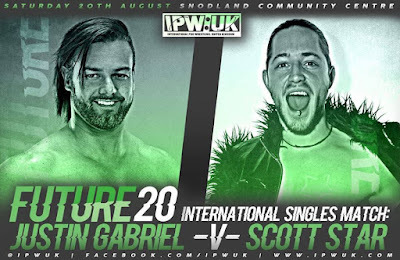 A tag team classic in IPW:UK could well take place at the Snodland Community Centre. Chakara is a young star from the IPW:UK training academy with a lot of potential. She has competed in a few matches in IPW:UK and has impressed each time. She faces a real test this Saturday though as she'll be competing against former IPW:UK Women's Champion, Jetta. While there may be a revolution taking place within women's' wrestling right now, Jetta was fighting all over the British Isles longer before it started. She's faced some of the best in the world. Chakara will learn a lot in this match regardless of the outcome. She'll also learn what it takes to face someone of a calibre like Jetta and if she has what it takes at this point in her young career. The wrestling weekend rounds off with Attack! Pro Wrestling making their return to Walkabout in Cardiff with (Thank God It’s Not) Winter Slam. The show will see the semi-finals of the ATTACK! Championship tournament take place. The first semi-final will see “The Pride Of Wales” Eddie Dennis take on Wild Boar while “Ginger Jesus” Mike Bird shall compete against Los Federales Santos Sr. If you can pick the winner of these matches then you're either guessing or have the gift of foresight. The only think we do know is that after Sunday we will know the final of the tournament to crown a new champion in Attack! Pro Wrestling. This Sunday will see the return of Pete Dunne who will compete for the first time since being suspended for attacking a member of Attack! Pro Wrestling's staff at a previous event. His opponent will be another man making his return, “The Mexican Sensation” El Ligero. Often attributed as being the hardest working wrestler in Britain, Ligero has faced Dunne on numerous occasions. Each time they have met, they've been memorable. There is little doubt that these two men are going to deliver another cracking match this Sunday. The main event at Walkabout in Cardiff will see Bayside High's Nixon Newell and Mark Andrews defending the ATTACK! Tag Team Championship against Chris Brookes and Kid Lykos of CCK. These two teams have met before over championship gold and they tore the house down. This time they may actually tear down Walkabout as this defence will be a Tables, Ladders & Chairs match. All four of these competitors take big risks in normal matches in the pursuit of a win. The carnage that is going to take place with tables, ladders and chairs all being legal is unfathomable!